experienced: the view from the top of North America's highest peak! 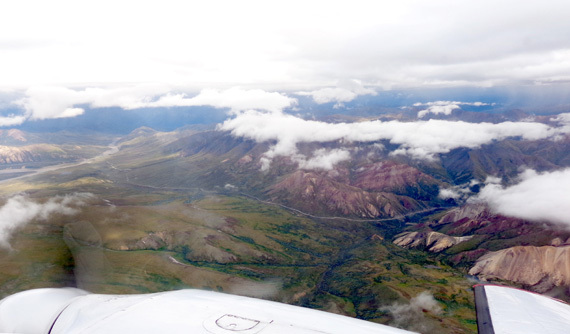 Of all the things on our list of things we wanted to do at Denali National Park, taking a flight tour over The High One (the Native Alaskan meaning of "Denali") was at or near the top of our priorities. Flights are expensive (about $349-$449 per person this summer) and since the mountain is more often shrouded in clouds than not, we waited until yesterday to reserve our seats, hoping that the good weather forecast would hold out. 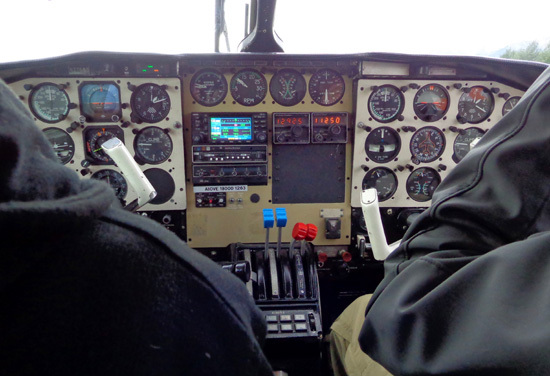 If the weather isn't conducive to safe flying over the Alaska Range, the air companies don't fly. 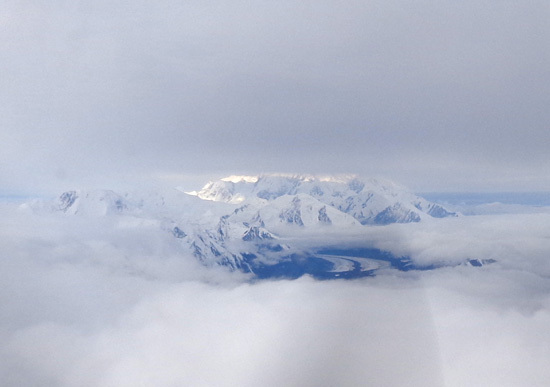 In addition, we wanted to get good, clear views of Denali, not partial ones obscured by clouds or rain. when we got close to the south and north peaks on our flightseeing trip today. We woke up to mostly cloudy skies and only a little bit of sun at Riley Creek Campground just inside the entrance to the park. We remained optimistic, however. 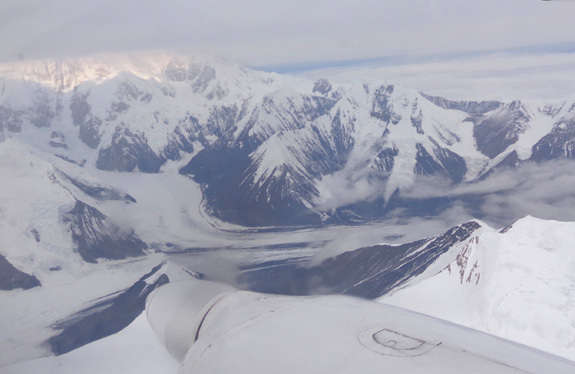 Although we had no clue re: the weather at 20,320-foot Denali, which is about 75 miles south of the campground, Fly Denali was on top of it (so to speak) and our flight was a "go." 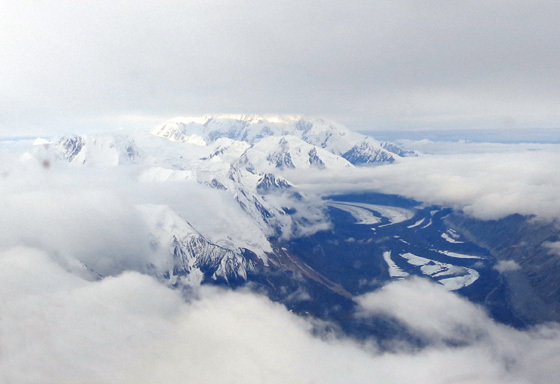 Another sneak peek at Denali's north and south peaks from the air . . . I believe this is the south buttress. I mentioned in the first of yesterday's entries that we got a good discount on our tickets through a reference from CJ, our campground host. The rate we got for RVers is 15% off the regular price, better than the 10% military discount we also qualified for. 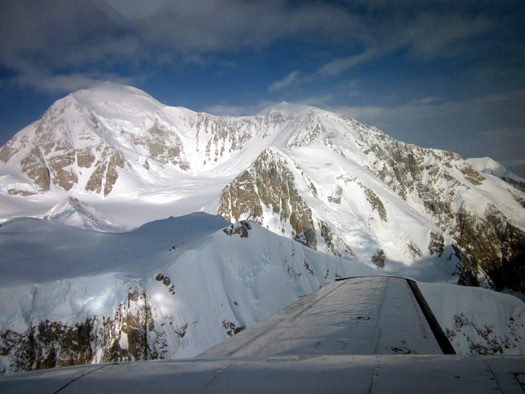 Fly Denali has other discounts, too, so check them out before booking a flight to see if you qualify for one. And check with other companies to compare features and costs. 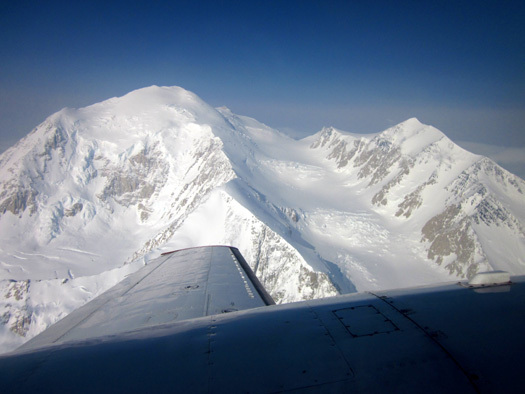 The air company we chose appears to go by two names: McKinley Flight Tours and Fly Denali, Inc. The phone numbers are the same. Since the website is Fly Denali I'll stick with that. JIM AS "CO-PILOT:" THAT'S MY BIRTHDAY PRESENT! This morning we drove north a few miles to a private RV park where the air company van picked us up. Five other people in their 60s and 70s were already in the van. They are staying at a lodge in Nenana Canyon outside the park entrance. 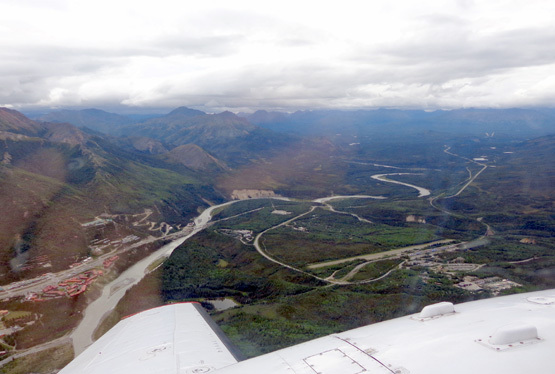 The driver took us a few more miles to the little airport in the town of Healy, where Fly Denali begins their flights. 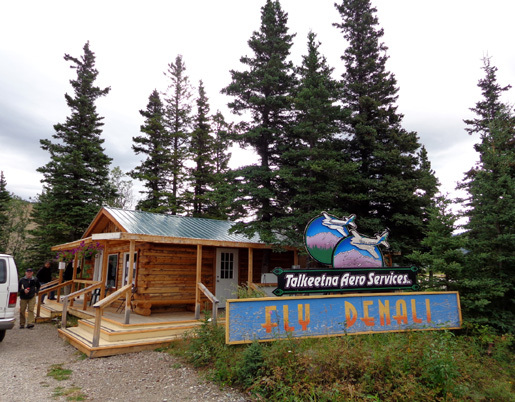 They also fly out of Talkeetna. 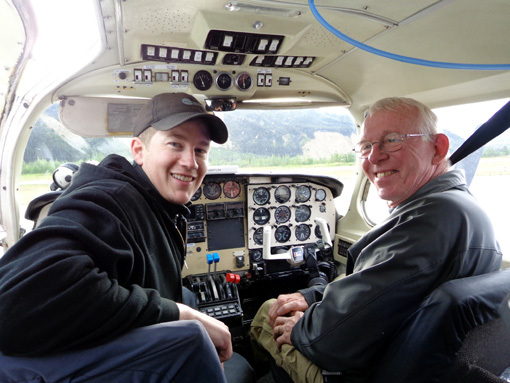 When he called to make reservations yesterday, Jim asked if he could sit next to the pilot. The woman booking the reservation said no one else had asked, so he could have that seat upon the pilot's approval. Seat assignments were by weight and sort of how we checked in. Jim and I were first in line. I was seated behind the pilot and a man by himself was in the seat on the other side of the aisle. The three couples were seated across from each other. 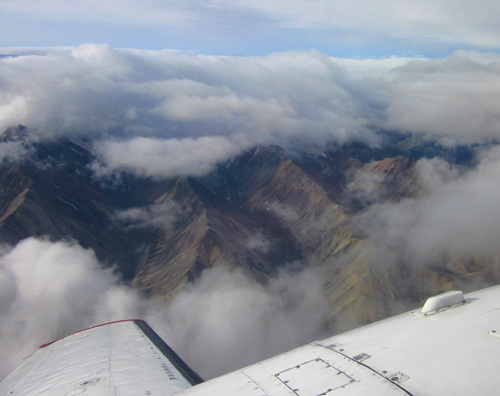 In these small planes, everyone has a window seat. While we could still hear each other talk, he commented that being up front was his "birthday present." I mentioned in the August 1 entry about how we do (or don't) celebrate birthdays as we age. Gifts are a rarity because we usually jut get what we want, within reason, when we want it and then say, "That'll be my birthday/Christmas/etc. present." Jim and I were sitting close enough together that we could swap cameras easily. Whoever was on the side with the best views at the time used the 16-megapixel Sony compact digital camera. We used the 12-megapixel Canon compact digital for less important pictures. Most of the photos on our website are ones I've taken. In this case, we don't remember who took what pictures from the plane. I just chose the ones shown in this entry as the best representation of the various things we saw today. Jim probably took as many of them as I did. 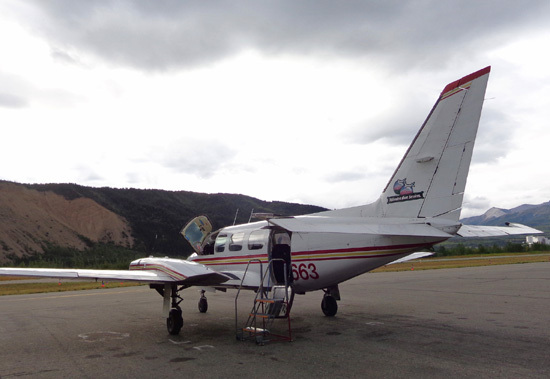 The Piper Navajo Chieftain low-wing plane we boarded holds nine passengers but it flew today with just us seven. We boarded front to back, so Jim and I were the first ones on. 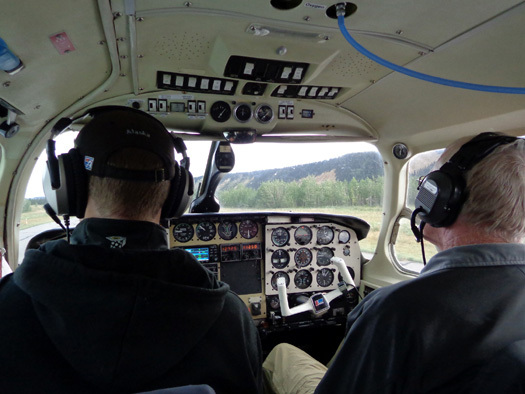 Once we were on board Trent explained how to use the head phones, which we wore the whole trip so we could hear him above the noise of the engines, and the oxygen masks, which we used only between 13,000-21,000 feet. The plane is un-pressurized. 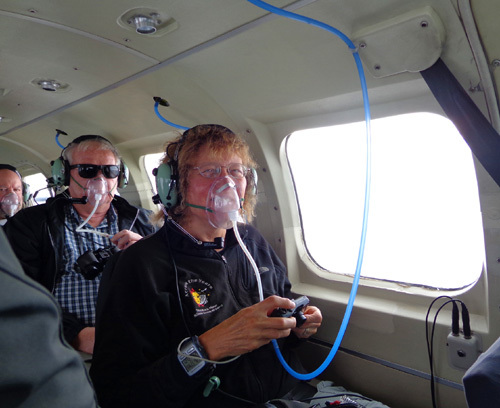 Trent said there is three times less oxygen at 21,000 feet than at sea level. Supplemental oxygen isn�t a necessity for these trips but he explained that we�d all be a lot more comfortable using it. No one on our flight got sick and no one had any trouble breathing or with their ears coming back down. 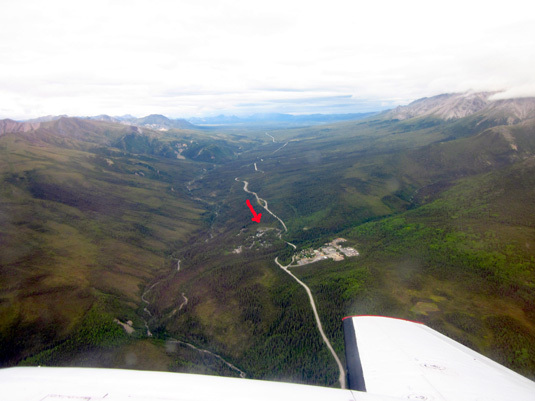 I forgot to turn on my Garmin GPS until we were over the park entrance, about ten miles from the airport in Healy. My GPS recorded 274+ miles so we did a total of about 285 miles in the plane. 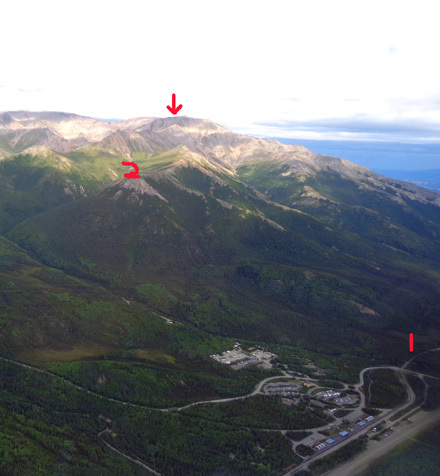 Altitudes on my GPS ranged from 1,279 feet on the ground to 20,713 feet at Denali. 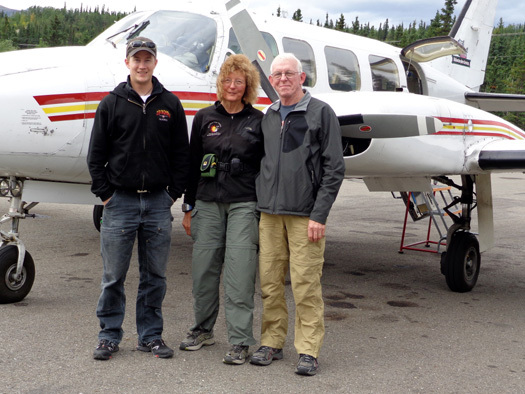 Jim says the plane�s altimeter was about 200 feet lower than that at the mountain. He had fun reading the gauges, since they were right in front of him. 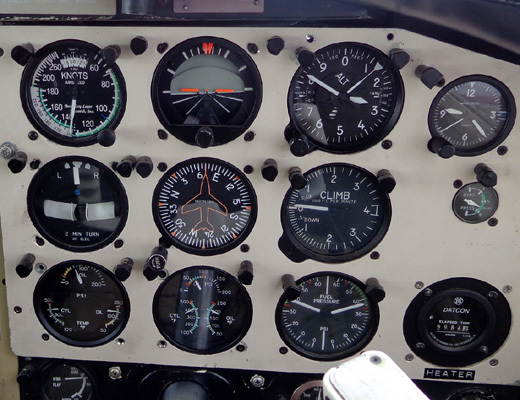 I couldn�t see all of the gauges but I had fun watching my GPS. Many of these photos show the wing and/or engines at the bottom so I can include more of the scene. see yesterday from the ridge to Mt. Healy but this was a different perspective. We won't be able to see all this from the bus. Some things can be seen only by air or on foot. 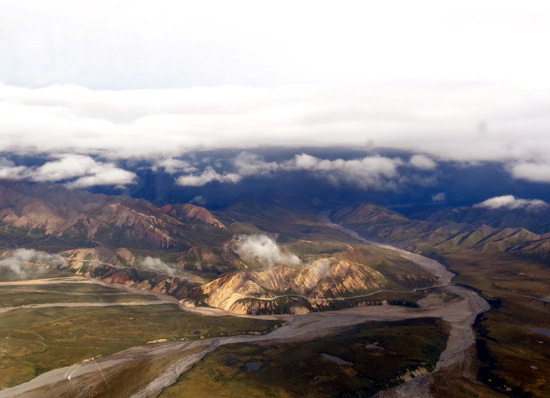 The narrow park road winds high above the Toklat River near Polychrome Pass. 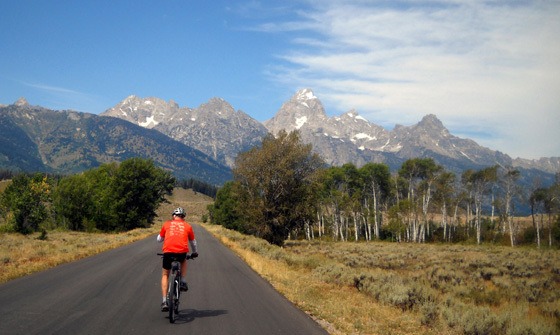 Can't wait to see this area along the park road close up on our first bus tour later this week! 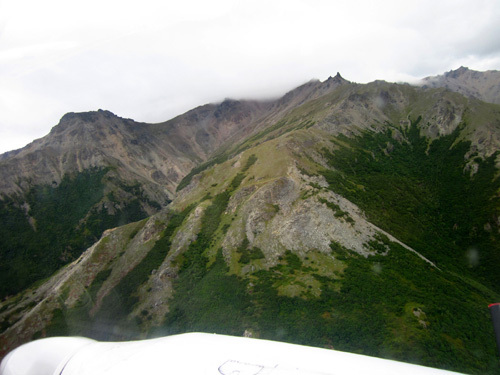 As he flew along Trent explained what we were seeing � the park road, Polychrome Pass, various rock features in the mountains, where the mountain goats and Dall sheep usually hang out, various named glaciers, names of mountains, etc. He tilted the wings so passengers on each side of the plane could see better and take pictures. About 60 miles into the park Trent began heading mostly south over the Alaska Range to Denali, the showcase mountain in the park -- and North America! 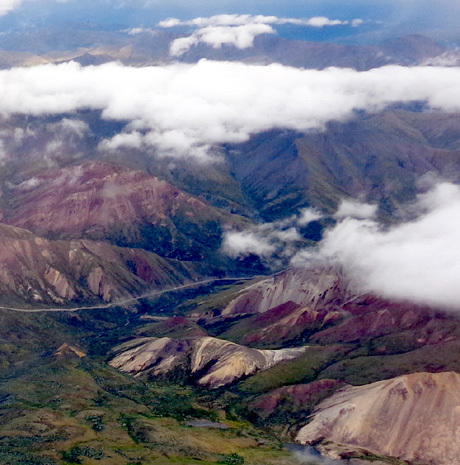 We could hear the radio traffic from ground control and other Fly Denali planes as we were heading to Denali. Other pilots who arrived before we did were reporting enough holes in the clouds to see the north and south peaks clearly. 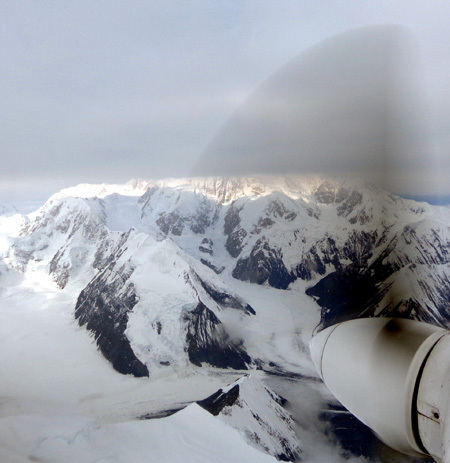 The dark hazy half circle is the moving propeller of the plane; more glaciers below it. We lucked out. Denali was even more in the sun when we got close to it! We got our wish to see the mountain peak nearly free of clouds! !